A new hypothesis to chew on. Now if only I'd drawn Then as a giant with a bushy beard. Is that Plo Quar in the background? No, it’s just s a generic sarnothi. I understood 0 of that. It has been draining power from Selkie, imo. i agree. my guess would be that the ‘very few’ are highly sought after, odds are there are even detectors for the energy they´re emitting to locate them…and with selkie being part of the ‘enemy’-clan AND the daughter of the leader of the resistance she would be fair game to the sar´teri to use her – or kill her before she grows up and uses her powers for the war. so mom gave her the bow to constantly drain her energy to make her level appear average. but didn’t Agent Brown or Pohl say if enemy-clan tries to get the people the fled the USA would go to war with them. *snort* so? who says they´ll outright ambush her? a nice little accident, or simply making her ‘disappear’….don´t tell me uncle sam would start a war with people that officially doesn´t even exist without even concrete proof over one little girl. Well Pohl said that Sar’Teri was warned with military retaliation, If they take action against refugees, Like selkie. or completely countering or jamming selkie’s energy field. highly sought after especially during a civil war. Technology as long as she is wearing the bow. Selkie and Todd to make. With the potential to be upscaled or reverse engineered. A whole family of “echos” away from the eyes of other sarnothi. Find such a safe house. Again perhaps finding selkie’s mother. You are overthinking it in my opinion. I think it’s just suppressing her powers because if you are leaving your magic kid with a bunch of muggles, having them start doing magic with none there to teach or guide them could end badly. O don’t think you’re overthinking it at all. This makes sense. In fact, I’d go a step further and suggest that maybe they weren’t detecting the bow’s energy at all. Maybe they were detecting Selkie’s. With her suppressor malfunctioning, they could have had enough time to get a location. Going by this strip: https://selkiecomic.com/comic/selkie578/ it does look to me like they were picking up the bow, or rather, the resonance projection it emits, not Selkie herself, seeing she wasn’t even home yet. As in, I think it’s supposed to make her not get noticed by humans. If the bow is supposed to “protect” her from other sarnothi it’s doing a bad job as so far it’s done pretty much the opposite. To be frank, Dave actually commended me on my attention to the details he includes in the comic. So to be fair, it’s you who isn’t thinking hard enough about potential plot-lines, and sub-plots. Always assume the author has some hidden drama that he only hints at, until it’s time for the big reveal. I don’t really appreciate seeing a compliment I paid you weaponized like this. I wasn’t trying to weaponize it. He seems to think only his ideas are valid. I was trying to get across to him he should be more open to other ideas. I know most of my conspiracy theory will miss the mark. But i still put it out there for people to think about. Not wanting to turn this into an argument, disagreeing with your theories was not meant as an attack so sorry if my tone came off that way. Think you already summarized the difference here though, you are thinking in terms of potential plot lines (someone could be after Selkie after all, no evidence they aren’t) while I’m taking more of an occam’s razor approach (there’s no evidence that anyone is after Selkie so I’ll assume that till shown otherwise). I like that, where’s it from? I am telling you all of this secret information as a favor to you, I ask nothing in return. But if, at some point in the future, I need a favor I would ask that you do this for me. We may need to weaponize Selkie. She’d be totally down with that, too, just look at that grin. Congrats Dave for pulling a surprise I never would have guessed. In what way has it gone full fantasy? Its pretty much science fiction. A technological power source which some Sarnothi are able to make use of more than others. Ah, the old dream of nearly every child… To have a superpower. Too bad that the explanation of this phenomenon probably will be more… mundane. That is the cutest Selkie smile ever. Just looking at it makes me feel extremely happy. This is getting so dumb. Wasn’t this comic supposed to be a slice of life? Hay don’t feel bad you can’t please everyone. Please don’t listen to the nay-sayers. You’re providing an engaging thought-provoking fun comic for free. I for one not only really appreciate that, but also you’re tact in how you handle the comments down here. Please know that the vast majority of us who comment actually understand that you have a life and do this because you enjoy it and like to share it, not because you *have* to. You have a story and allow us to go along for the ride. We aren’t the directors, you are. Really? 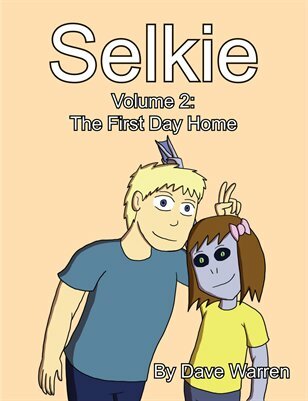 You expected a comic about a guy who adopts an alien species daughter to simply be a “slice-of-life” comic? Its been pretty clear for a LONG time now that Selkie was not going to be a slice-of-life comic, there have been ample examples of going in to the more sci-fi and dramatic direction for parts of the story. I’m not saying its even off limits to dislike some of the creative decisions or specific execution Dave makes (I certainly have), thats fair for any creative work. However, its extremely odd that you would be so upset by the idea that this comic isn’t slice-of-life at this point. And its totally cool if the comic isn’t for you, it doesn’t have to be, and you don’t have to keep reading it. People stop reading comics/watching shows/reading book series all the time because they no longer feel its worth their time or fits their interests. But you could be a little more polite about how you handle that. Monster girl, magic, and government conspiracies have been part of it pretty much from the start. Agent Then: You’re a Wizard Selkie! Please tell me I’m not the only one that thought of that. So, now that we know what an Echo is… Agent Brown was hoping Selkie would turn out to be a fourth Echo. Who are the other three? I’m guessing Pohl is one – he’s been shown to be doing resonance stuff without any device, and also made Sai Fen’s bracers. Selkie’s mom might be one due to the creation of Selkie’s bow, but dunno if the agents would know about her. You would assume they would know about Selkie’s mother since she’s the one who gave Selkie to the orphanage as a test case. I seem to remember she just showed up and dropped off Selkie all by herself, agents only got involved after. Trying to find the strip on it. Dave, one of the few things about your art that I really hope you improve sooner rather than later: Watch out for where foreground and background objects overlap to create tangents. I’ve seen it quite a few times in Selkie, and here it’s Agent Then’s nose butting up against the people in the photo and his mouth looking like it’s swallowing the picture frame. Basically, effective art doesn’t lead the brain to make wrong assumptions about how two lines are connected, so you look for ways to overlap that don’t create visual confusion. when one uses the energy however the out side energy refills the source of depleted energy, BUT only if the individual can even use the energy in the first place. I’m thinking currents – like water currents/electricity currents. Other mammals in water have adaptive traits due to the currents so it would make sense that Sarnathi would as well. A witch, you say? Does she weigh as much as a duck? Can she turn people into newts? WILL THEY GET BETTER?!? No silly; you aren’t a witch. You”re a jedi. I miss the way the comments section used to be.